Katie Mae Quilts: Flirt Marks the Spot - Finished! Flirt Marks the Spot - Finished! There is nothing that I don't love about this finish. I love the pattern, from McCall's Quilting Magazine. When I saw it, I immediately envisioned it in Sandy Gervais' Valentine line. Because of course. I immediately envision most patterns in SG's Valentine lines. Doesn't everyone? 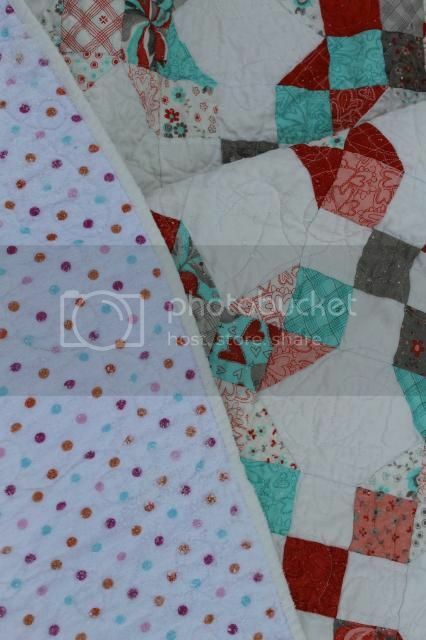 I knew I wanted to quilt it with daisies, but I've not yet tried flowers. So I used a pantograph - Hearts and Daisies. It was easy to follow and I definitely gained a lot of muscle memory for flowers! I tried to keep it slow and not loop when I changed directions - something I struggle with when I move faster. I love how it came out. The border fabric isn't SG. I walked into one of my LQSes, spotted this immediately, then wandered around the whole store because, really, the first thing? There has to be something better. There wasn't. It's Amanda Murphy's Bella. The backing is - don't tell the quilt police - a full size flannel flat sheet from Target. Yes, I prewashed it, and yes, it has a looser weave than pretty much any flannel I've bought from Joann's or a quilt store, so I wasn't worried about it on the machine. And it's big enough without piecing and it's adorable little dots and it matches quite well and I still have the pillowcases and fitted sheet that I can hand over to my mother-in-law to make jammie pants with. Label stitched on, but not yet labeled. 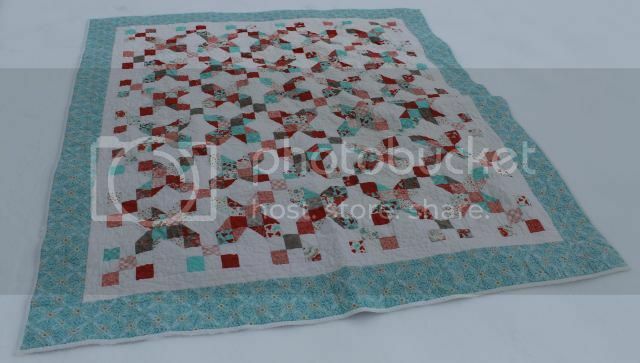 What's not to love about this gorgeous quilt! This is just delightful. Such thoughtfulness throughout and it shows. Nice! 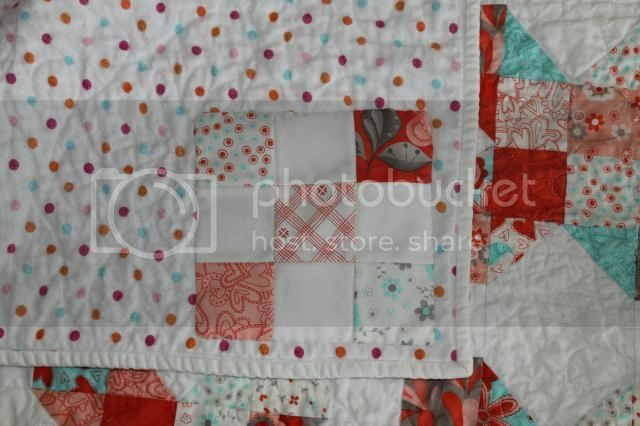 It looks great, I love the backing, from the photos you'd think it came from the same collection - I would not have guessed it was a flannel sheet. It looks so nice and cozy! I'm loving your fabric! 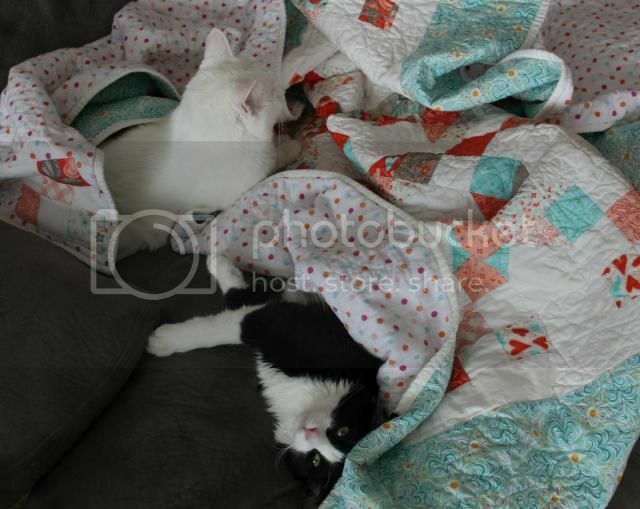 Beautiful quilt, I love your fabric. I also like that you put a leftover quilt block on the back for a label. What a great idea and a good way to use up those leftover blocks. It's beautiful! Great job with the flowers and hearts too. Great job. Really like the color combination. Backing goes with the top nicely. 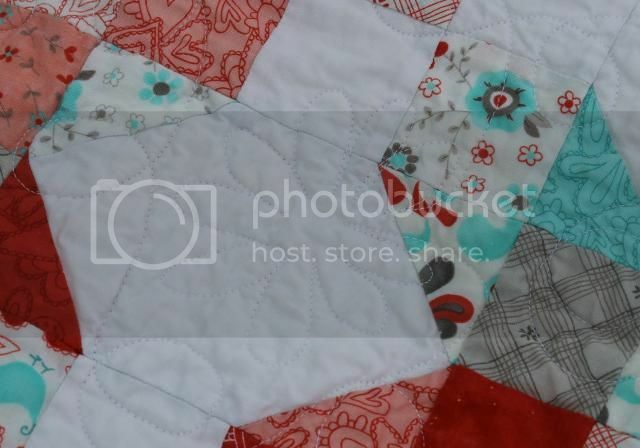 I love every single thing about this quilt - adore, adore and adore some more! What is not to love. It is a great pattern and beautiful fabrics. Enjoy the quilt. 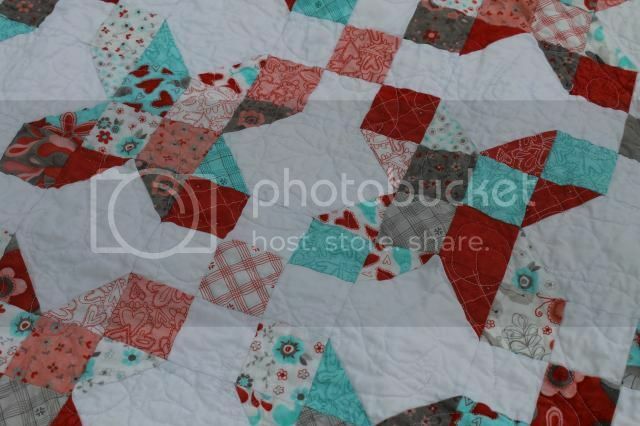 That's a great pattern and quilt and the border really sets it off well. Beautifully done. The little block on the back is so sweet!! Congrats on another finish. It's gorgeous! I love the backing! 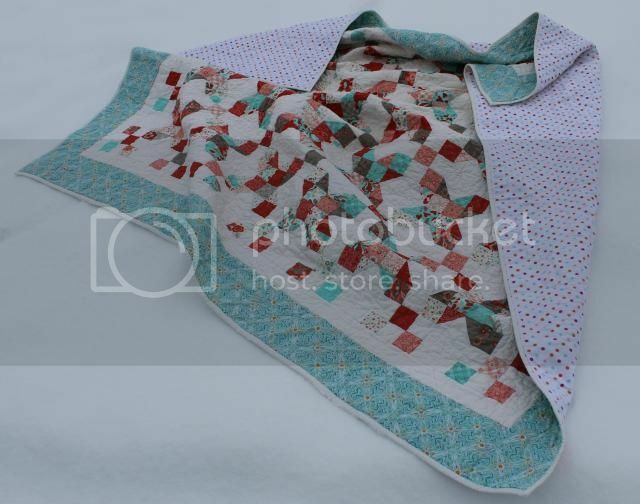 Make sure you let us know how it washes and wears :) I love flannel backings on quilts :). Thanks for linking up!! Owl Always Love You - Finished! Hearts Table Runner - Finished!